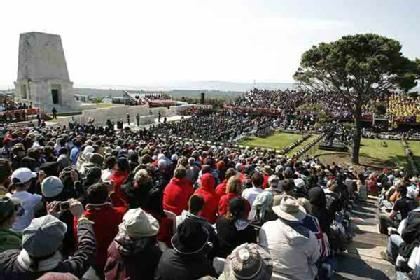 As soon as we are able to, you are taken to the site of the dawn service to get a good spot. There are food stalls selling a great variety of Turkish Kebabs, pancakes and fast hot foods close-by so you won't go hungry. There is a unique feeling in the air, a celebration of peace subdued by a cloud of commemoration. 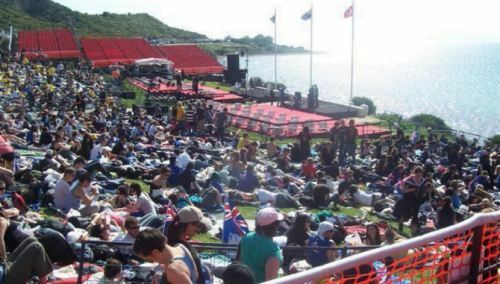 Within a few hours, the site will appear like a sea of colour with Aussies and Kiwis sprawling out on the grass, warmly wrapped up in sleeping bags, National flags flying high and rugby tops on their backs. Get a few hours of rest/sleep on the grass because soon the MC wake you for the ceremony.. 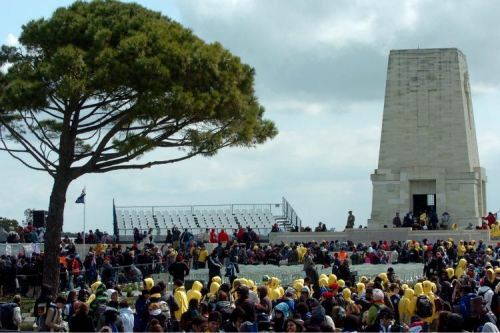 The Anzac Commemorative Site is expected to be closed to visitor entry from approximately late morning to 22:00 Thursday 24 April. 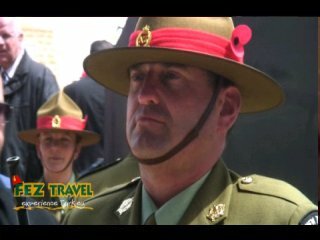 ANZAC Day, how does it work? 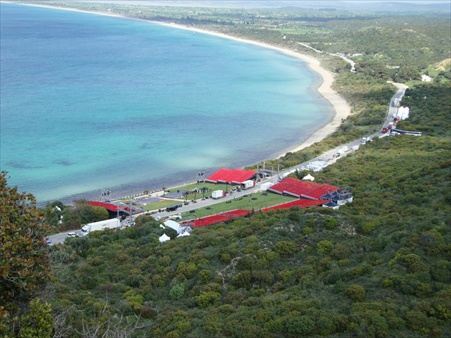 From the turn off to the Gallipoli battlefields you will travel across the peninsula towards Gabatepe then head north towards the Anzac Commemorative Site. The bus will turn into a small car park, adjacent to Brighton Beach, where coaches and their passengers are welcomed by a member of the visitor services team who issues each coach with a coach identification number. Each passenger will also receive an individual tag with their coach number on it which you should attach to your clothing. This will help visitors to indentify their coach at the end of the services. From the 'Tag Point' your bus will procede north to the drop off point, near Beach cemetery, where you will leave the bus. Be aware that any opened bottle will be confiscated so if you wish to take your own water into the site, don’t open it until you have passed through security. There are food and drink vendors selling water also. When you disembark from your coach you must have everything you will need for the evening and next day, including medication. You cannot return to your coach until after the services have finished on the afternoon of 25 April. 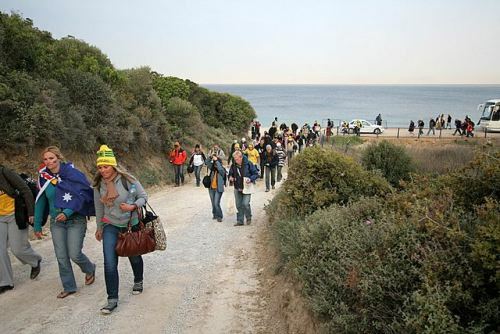 Having passed through security you walk approximately 1 km around ANZAC Cove, past Ari Burnu cemetery (where the Dawn Service was held until the year 2000) and along North Beach to the Anzac Commemorative Site. 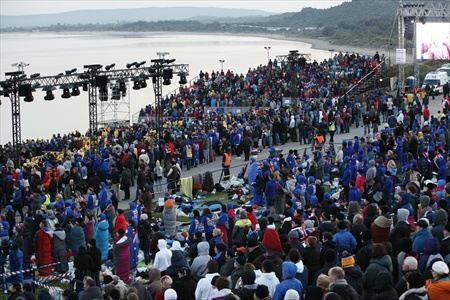 Once at the Anzac Commemorative Site its just a matter of waiting until 05:30 when the Dawn service begins. Food and drink vendors may found at the site. 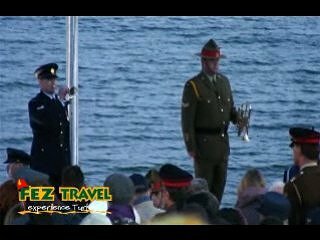 The Dawn Service finishes at approximately 06:30. 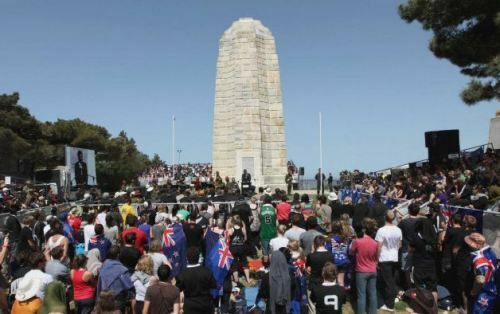 Once the dignataries, military represenatives and officials have left the site the gates are opened and everyone must make their way to either the Australian Memorial at Lone Pine, a distance of approximately 3.2 kms or the New Zealand Memorial at Chunuk Bair, approximately 6.4 kms. Getting to either service requires walking to and then inland along Artillery Road. 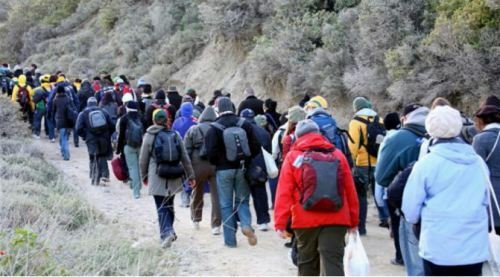 To get to Lone Pine you need to walk back past Ari Burnu, around ANZAC Cove, past Shrapnel Valley and Beach Cemeteries and continue along to Artillery Road, the turn left towards Lone Pine. Artillery Road was constructed during the campaign by New Zealand engineers. The turn off is about half way between the Commemorative site and Lone Pine. From the Artillery Road turn off the dirt track ascends just over 350 feet (106 metres) in just under 1.5 kms (0.9 mls) on graded dirt and uneven surfaces, and can be challenging to walk. 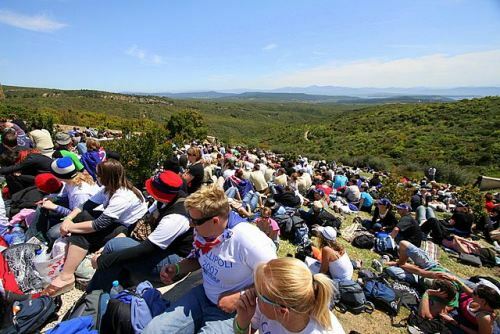 Visitors will need to walk up to 8km between sites, mostly uphill, including several very steep segments. Extremely limited support is available for assisted mobility visitors and this can not be guaranteed in advance. Visitors requiring mobility assistance will need to request this assistance at the information tent on arrival at ACS. Capacity for this assistance is limited, is provided on a ‘most at need’ basis and can not be guaranteed. The good news is that the Australian Service doesn't start until 9:30 am so you have about 3 hours to get there from the Commemorative Site. 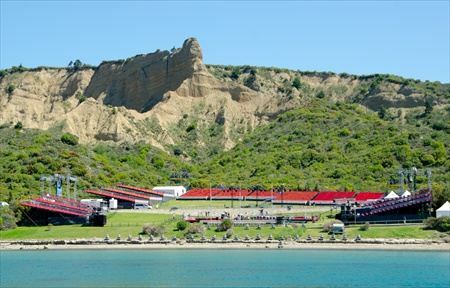 The New Zealand service starts at 11:30 am so they have 5 hours to get to Chunuk Bair from the Commemorative Site. So we recommend you take it at a casual pace. If you start to feel the strain stop and take a break. There are several first aid stations along the way. About half way along the track you will pass Shell Green cemetery where the troops played a cricket match, in December 1915, a few days before the evacuation. 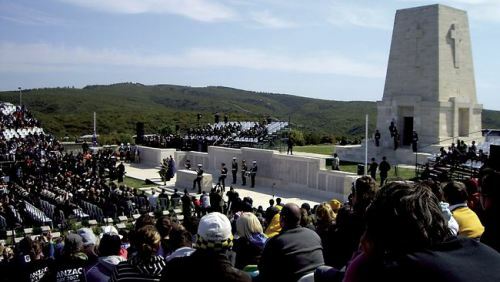 Visitors wishing to attend the Chunuk Bair service will not have time to also attend the Lone Pine service and will need to proceed directly to Chunuk Bair, a further 3.15 kms (1.96 mls), to be able to arrive in time for the commencement of that service. 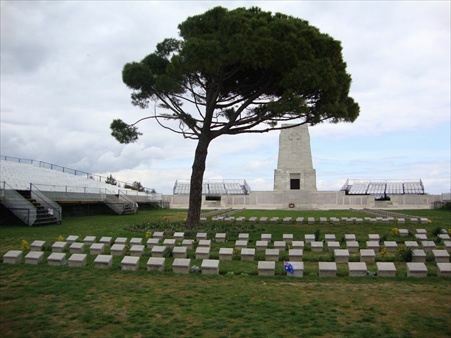 Lone Pine will close after the Lone Pine service and all visitors will then need to proceed to Chunuk Bair as coach loading will only occur at Chunuk Bair (Hill 261). 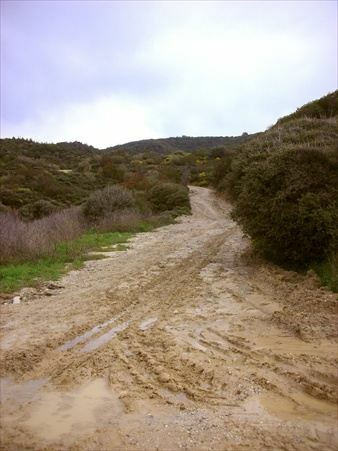 The walk to Chunuk Bair is uphill on a bitumen road and can be challenging to walk. From Lone Pine you should head north along the bitumen road, past the Johnstons’s Jolly, Courtney & Steele’s Post, Quinn’s Post cemeteries, the Turkish 57th Regiment Memorial past the turn off to The Nek cemetery where the road heads upward and inland passing Baby 700 cemetery long the way to Chunuk Bair. 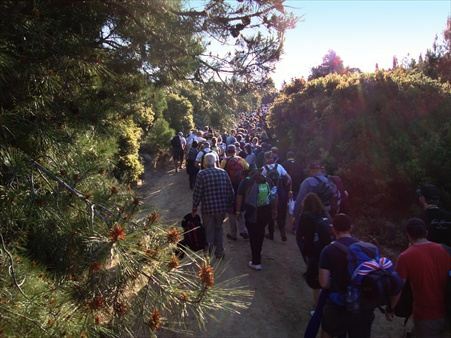 From Lone Pine to the turn off to 'The Nek' you are walking along the old front line. In fact you are walking along what was no mans land. You will see remnants of trenches and tunnels on either side of the road, Turkish to the right and Allied to the left. 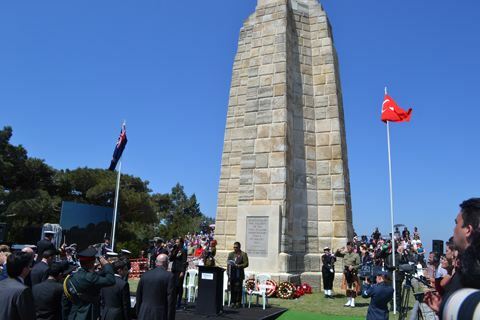 The Chunuk Bair service finishes at 12:30. 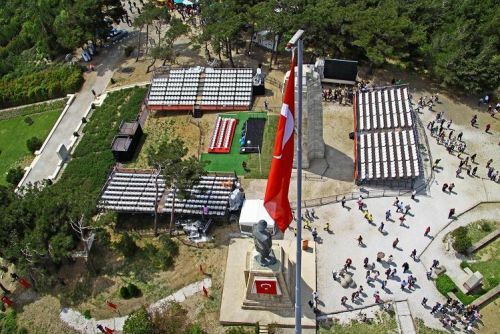 Following the conclusion of the Chunuk Bair Service at 12.30pm, coaches will proceed to Chunuk Bair to collect visitors. There is no specific order so you need to keep your eyes peeled for your bus. 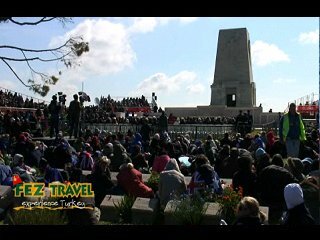 The Australian Dept of Veteran Affairs - "Anzac Day at Gallipoli" The Australian Dept of Veteran Affairs - "What to expect" The Australian Dept of Veteran Affairs - "Before you depart" The Australian Dept of Veteran Affairs - "ANZAC Day - General Info" The Australian Dept of Veteran Affairs - "Attendence Passes"